I finally got around to subjecting The Lulu to a simple test. I've been meaning to do it for ages and last night we cast ourselves headlong into the urban fray. I figured The World's Youngest Urbanist would have a good shot at it. 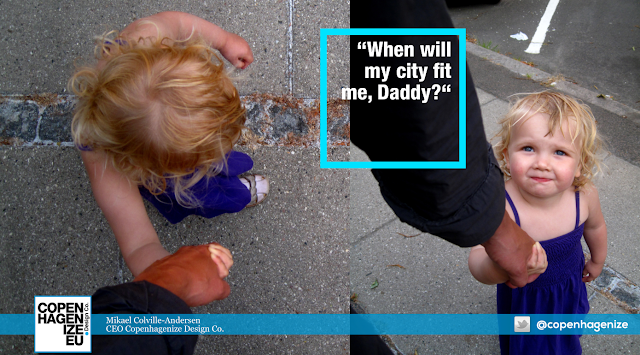 The Lulu, since she was 3 1/2 years old, has delivered a constant stream of urbanist wisdom. Indeed, I feature her in most of the keynotes I do around the world. The point being that kids are better at planning Life-Sized Cities than a room full of adults. While walking around our neighbourhood a few years ago, she dropped another wisdom bomb. We were waiting at a red light. She was a bit quiet and looking around. Suddenly, she looks up at me and says, "When will by city fit me, Daddy?" It was a frustration for her to be so small on the urban landscape. I assured her that she would grow. She just shrugged and said, "yeah". She knew that. But at that moment she didn't feel like her city fit her. That sentiment stuck with me. I started to think hard about whether my city fits ME. By and large, it does, this Copenhagen of mine. But there are still many places in this city where it doesn't. And most cities in the world don't feel like they fit me. They don't feel like they are life-sized cities. That phrase I came up with is a direct result of The Lulu's comment. Furthermore, it is now also the title of my new TV series - premiereing in 2017 - The Life-Sized City. The Lulu's observations can be profound, but they can also be simple. Like this one. Letting her loose with a camera on her urban landscape also offers up interesting street photography results. After she started to deliver her wisdom, I started to think about what kids could contribute. I got Lulu's big brother and his whole 3rd grade class in on it with this project. And I remain amazed at the logic and rationality that children employ.